To redefine our image of her people, photographer is out to show us every tribe. 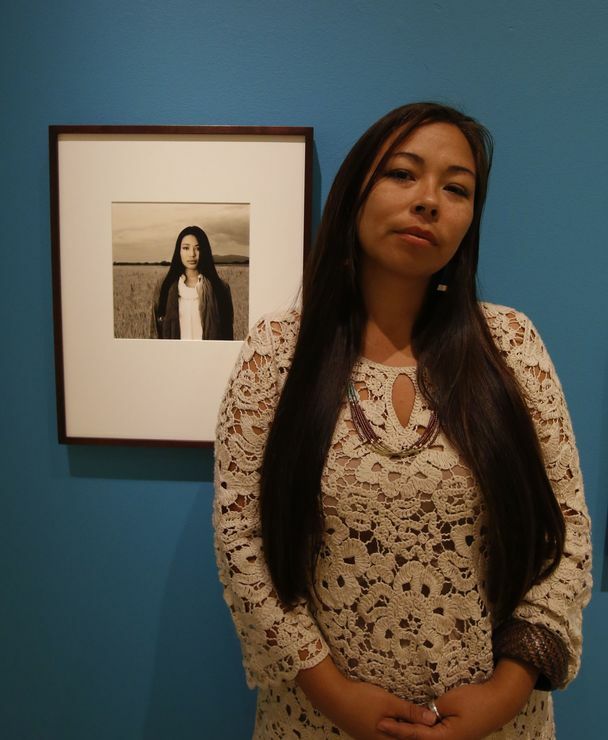 Matika Wilbur took this portrait of her niece, Anna Cook, for Project 562, a three-year, cross-country road trip aimed at documenting all of the nation’s 562-plus Indian tribes. Cook is Swinomish and Hualapai. The portrait is part of an exhibit at Tacoma Art Museum. THE PHOTOGRAPHER Matika Wilbur has a little exercise she encourages new acquaintances to perform. Do a Google image search for the term “Native American” and see what comes up. The first result on a recent attempt is a grainy, sepia-toned picture of an unidentified Indian chief staring into the distance like a lost soul and decked out exactly (and unfortunately) as one might expect — in a headdress of tall fathers and a vest made of carved horn. It looks to be from early in the previous century. The next six pictures, variations on this theme. It’s as if the society depicted in these images ceased to exist decades ago. Wilbur, a 30-year-old from Seattle who’s a member of the Tulalip and Swinomish tribes of Puget Sound, knows perhaps as much as anyone in America how laughably out-of-whack that Google-search result really is. She is halfway through an epic journey funded by everyday people via Kickstarter to visit and document every single federally recognized tribe in the United States — more than 500 in all. For the past year and a half, she’s been taking new images to replace the tired ones that pop up in Internet searches, in the mainstream media — and in our minds. She calls her three-year campaign Project 562, the “562” representing the number of recognized tribes when she started out; there were 566 as of this spring. The first 50 or so gallery-ready images from the project are on exhibit at the Tacoma Art Museum until Oct. 5. It is the most ambitious effort to visually document Native Americans since Edward Curtis undertook a similar challenge at the beginning of the last century. Back then, it was widely believed that Indians on this continent were going extinct and needed to be photographed for posterity. Wilbur is also concerned about photographing Native Americans for posterity, but her project is more a story of survival and advancement than extinction. Some of Wilbur’s Project 562 portrait subjects live closer to home, such as sisters Darkfeather, left, Eckos, center, and Bibiana Ancheta, from the Tulalip Tribes north of Seattle. Wilbur is also a Tulalip member. Wilbur’s first name means “messenger” in her tribal language, and she more than lives up to that title. She pursues the issue of Native American identity with the zeal of an evangelist. And she doesn’t mince words. “How can we be seen as modern, successful people if we are continually represented as the leathered and feathered vanishing race?” Wilbur says in a clip on Kickstarter. In person, she makes an equally powerful impression, telling stories, laughing out loud and giving hugs, but also speaking earnestly about her work. Taking a break from the field to attend the opening of the Tacoma exhibit this spring, she pointed out that images such as hers have an impact well beyond museums and classrooms. Native Americans make up only 1.7 percent of the U.S. population, or about 5.2 million people, according to the 2010 Census. As Native American tribes negotiate for things like federal recognition and access to natural resources, Wilbur says it helps to show that Indian society remains intact and functional, albeit diminished. PROJECT 562 officially launched in the fall of 2012, when Wilbur, a schoolteacher, decided to give up her apartment in Seattle’s Capitol Hill neighborhood along with “a salary, a really cozy bed and a juicer!” and hit the road. She laid the groundwork by networking through Facebook, tribal newspapers, cultural leaders, professors and even distant relatives to get out the word and drum up contacts. She launched the first round of her Kickstarter campaign to fund her travels, raising $35,000. Then Wilbur packed up her Honda with her belongings, as well as personally canned fish and berries from the Northwest to present as gifts to her hosts around the country, and headed out. To date, she has visited more than 220 tribal lands from Long Island to Louisiana, Hawaii to Alaska, armed with little more than a camera and audio equipment, and a willingness to live out of her car and sleep in the homes of strangers. Wilbur jokes that there are only two degrees of separation between people even in the most far-flung sections of Indian country. Still, it can take time to follow the necessary protocols with tribal leaders and identify portrait subjects, and days more to build rapport before the camera comes out. In the field, Wilbur, a people person if ever there was one, sings and dances and cooks and feasts, gaining access to tribal events and behind-the-scenes moments that are off-limits to most outsiders. “I can hang — I’ll do your dishes!” Wilbur says in typically animated fashion one day while “hanging” in her old stomping grounds on Capitol Hill. Wherever she visits, locals make a way for her. “It’s like they take pity on me,” she jokes. Wilbur, who maintains a small staff of volunteers based in different cities, seems to have struck a chord. A second Kickstarter campaign to raise $54,000 more to continue the project netted pledges totaling nearly four times that — $213,461. The Tacoma Art Museum helped raise $20,000 to print silver gelatin images on display there. Project 562 is only partly a photographic journey. It is also a social documentary, a contemporary oral account by people young and old, rancher, blue-collar and professional, of what it’s like to be an Indian in the United States. At the Tacoma exhibit, recorded audio and video interviews accompany the portraits, adding nuance and resonance to the framed and in some cases hand-painted pictures. Subjects speak frankly about experiencing racism, their connection to the land, spirituality and personal identity. It is not always easy listening. That interview saddens Wilbur even now. But she believes that by having Cook expose her deepest anxieties about being Native American, she will inspire other young Native Americans to do likewise — and open a window for the rest of us. WILBUR HAS tackled the issue of Indianness before. In her earlier exhibit, “Save the Indian, Kill the Man,” Wilbur plays off the 19th-century U.S. government practice of sending Native American kids to boarding schools to assimilate them. The pictures explore how genocide and the loss of language and traditions contribute to problems such as substance abuse among Indians, which she believes is caused, in part, by a desire to numb the pain of historical and present-day ills. Native Americans and Alaska Natives have among the highest rates of alcohol-related deaths and suicides of all ethnic groups in the United States, according to the Centers for Disease Control and Prevention. Wilbur says it’s crucial to deal openly with the “sickness and toxicity” that plague Native American communities. At the same time, it’s important to combat stereotypes perpetuated in, say, old “cowboy and Indian” movies, as well as depictions of drunken, downtrodden urban Indians, she says. What’s striking about Wilbur’s pictures is the flattering way Wilbur has chosen to portray her subjects. The exoticism of the “noble savage” is replaced by an everyman sort of dignity. Majestic, natural backgrounds suggest a deep pride of place. The viewer can sense Wilbur’s determination to reset our attitudes about Native people. First, Wilbur had to wrestle her own ideas about what it means to be an Indian. Wilbur’s mother, Nancy Wilbur, whom she describes admiringly as “an old-school hustler, a total entrepreneur,” was an Indian activist who ran a Native American art gallery, called Legends, in La Conner when she was a kid. There, across the Swinomish Channel from the reservation where she grew up, the young Wilbur had privileged encounters with influential artists such as Marvin Oliver and Douglas David, who’d stop in to show off their latest work. Wilbur’s Swinomish family has a deep connection to the land around La Conner; a road near town even bears the Wilbur family name. There was much that Wilbur could’ve been proud of in those years — but she was angry. At college in Montana and then Southern California, where she earned a bachelor’s degree from the Brooks Institute of Photography, she became tired of fielding ill-considered questions about her identity. Explaining to people unfamiliar with Northwest Coastal culture that “No, I didn’t grow up in a teepee” can wear you down. Even though she knew the stereotypes about contemporary Indian life were wrong, Wilbur was “too young and naive” to figure out what actually did represent her culture, or why certain ills within her community persisted. “I didn’t understand why my people were sick; I didn’t understand why I had been to 70 funerals,” she says. It took some time to connect the dots. After college, Wilbur traveled abroad in search of herself, spending time in Europe, Africa and South America, where she photographed indigenous communities in Peru. Wilbur came home inspired. Instead of thinking of her heritage as a burden, she’d work to showcase it. She would be “my grandmother’s granddaughter,” passing on the positive traditions and beliefs handed down to her while documenting efforts to improve life for present-day Native Americans, from programs to revive fading tribal languages to ones aimed at improving health-care outcomes on reservations. Her portraits don’t avoid colorful Indian attire and ceremonies — far from it. From White Mountain Apache crown dancers in full body paint and headdresses to traditional hoop dancers, the collection celebrates custom and ritual. But presented among pictures of academics, activists, students, family men, career women and cowboys who are Indians, these images have a more appropriate context. When the exhibit opened in Tacoma this spring, Wilbur invited local relatives, project volunteers and subjects from around the country to the opening party to present blessings of song, dance and storytelling. What could’ve been a stodgy reception turned into a moving and at times rousing affair, with a stunning cross-section of Native American society on hand — Puyallup, Tulalip, Swinomish, Paiute, Pima, Crow, Yuma, Apache and beyond. Thosh Collins, a portrait subject from the Pima of Arizona, remarked on the uplifting spiritual energy in the room. “What she’s doing is healing work, wellness work,” he said of Wilbur’s pictures. At times like this, it’s hard to ignore the sad fact that this country’s Native people have few opportunities to celebrate across tribal affiliation in a mainstream space like an urban art museum. And it is even rarer for non-Natives to bear witness to such a gathering. 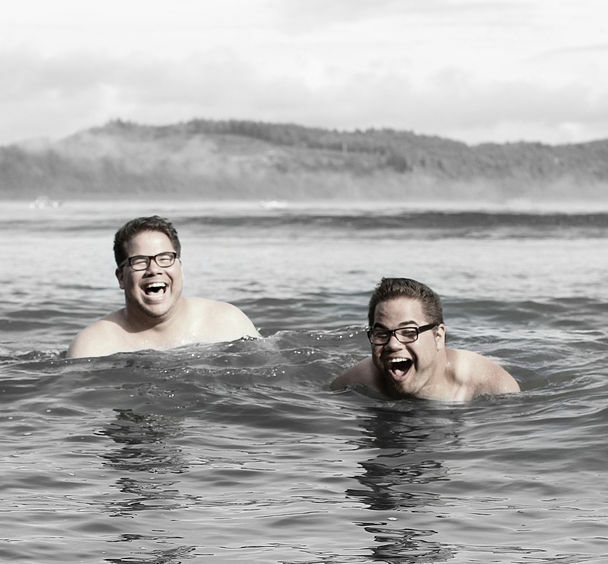 Rock Huska, the museum’s curator for Northwest Contemporary Art, admits that TAM has limited experience with Native American art from the present day. And it is taking a huge gamble in helping an artist in the field to bring her project to fruition. The exhibit on display now is, in a sense, a test case for this type of collaboration. The museum will use feedback from paying visitors to make needed refinements and decide later how to work with Wilbur as she gathers additional material. Wilbur is engaged in two kinds of image-making — and only one involves a camera. But when Wilbur uses that term, she isn’t just talking about physical beauty. She’s also talking about doing things that inspire others to make positive change in their own way — leading by example. As Collins sang a song with his dad and brother at the opening reception, Wilbur, wearing a traditional woven hat, led a large, smiling group of women and men locked arm-in-arm in a joyful circle dance around the museum’s atrium. Wilbur says her goal is to build a traveling longhouse that represents her Northwest Coastal Indian roots and can be set up in cities all over the world to showcase her portrait collection, reminding visitors that the communities represented in her images aren’t just a part of history — they’re still making it. Tyrone Beason is a Pacific NW magazine writer. Reach him at tbeason@seattletimes. Alan Berner is a Seattle Times staff photographer. 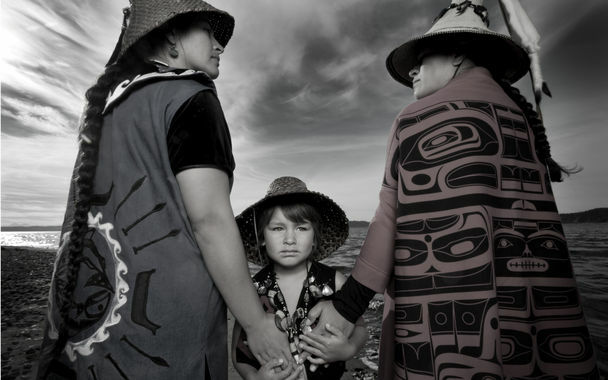 This entry was posted in Arts & Entertainment, Top Story and tagged Matika Wilbur, Native American, photography, Project 562, SEATTLE, Swinomish, Tulalip by Kim Kalliber. Bookmark the permalink.